Janet converted one of our empty bedrooms into a walk-in closet. That’s right, a closet. With special shelves for shoes. 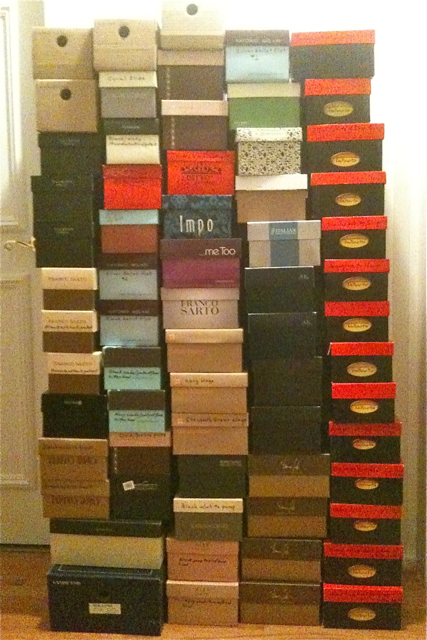 These are the shoe boxes she got rid of – which constitute about half her collection of shoes. When people ask me what our investments are, I tell them we are heavily invested in two things – education futures (i.e. our kids’ college educations), and shoes. She takes pretty good care of her clothes, so the collection has built up over time even though I know she’s given away dozens of pairs over the years. Next post: How’s Your Honey-Do List?